Seattle artist Darren 'Hubba Hubba' Floughton's latest show 'Pulpmania' is a twisted masterpiece, a demented homage to vintage pulp magazine covers wrought larger than life in carnival colors. We caught up with him in December 2012, shortly after the opening of 'Pulpmania' and at the beginning of the much anticipated legalization of recreational marijuana use in Washington State. At his warehouse, burlesque girls, cars and swirling pinstripe designs cover metal trays (one of Hubba's preferred mediums) and a full size B9 robot slowly takes shape in the corner, next to a handsome specimen of dinosaur chainsaw art. An old drive-in movie speaker is getting appended to a lamp as part of an upcoming art project. This is the workspace of a very busy guy. Hubba is grumbling about robot arms - "the damn things keep getting more expensive every year...if I was a rich man, I wouldn't have to build my own robot anyway, would I?" Pulpmania, hanging at Revolutions Cafe in Seattle's Greenlake neighborhood through January 22, 2013, includes 15 paintings, including several gigantic panels over five feet in height. Some themes - 'Startling Discipline' - for instance, are a bit shocking, given the neighborhood cafe setting. But, then again, it is Seattle and not, say, Richmond, Virginia. Each painting has a name tag which is a work of art unto itself. 'Evilbot' has a chimerical circuit board tag with vacuum tubes; the 'Amazing Fetishes' tag is a faux taxidermy squid mounted on a wall plaque. 'Homeward Bound' takes classic tattoo imagery on a perverted voyage of the mind as the viewer imagines the illustrations that might accompany the article titled 'naughty nautical knots'. Needless to say, the paintings installed as a group make a big impression. "I love it when my art connects with people who aren't expecting it. I went to NYC this fall and set up a booth in Union Square. There are a lot of puns in my art, and it's fun to watch people 'get it'." 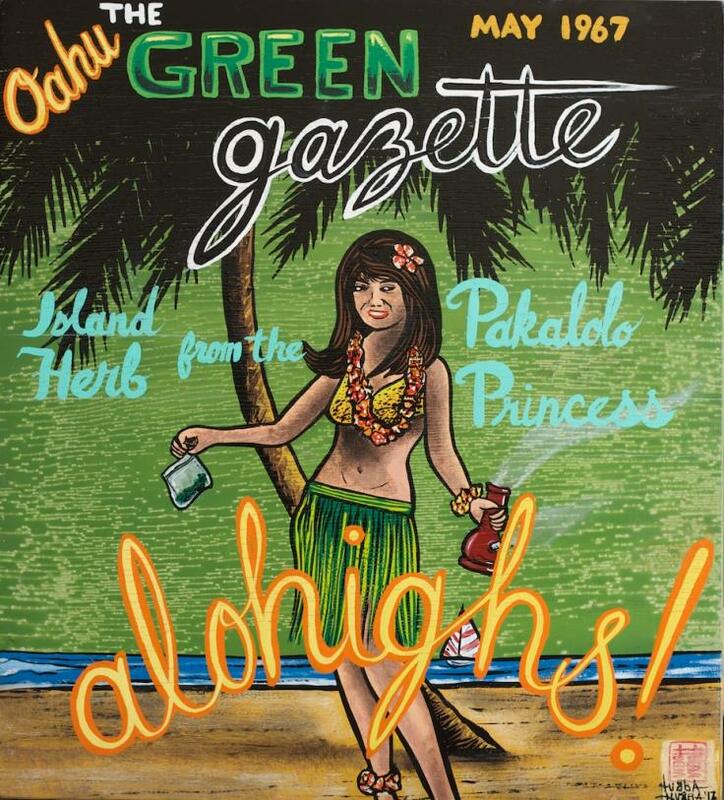 Marijuana is one of many themes covered by Hubba's paintbrush. Consider Leprechronic - from Hubba's 2011 'Tray Kool' show - an image of a glassy eyed leprechaun urging us to 'take the gold, just leave the pot'. 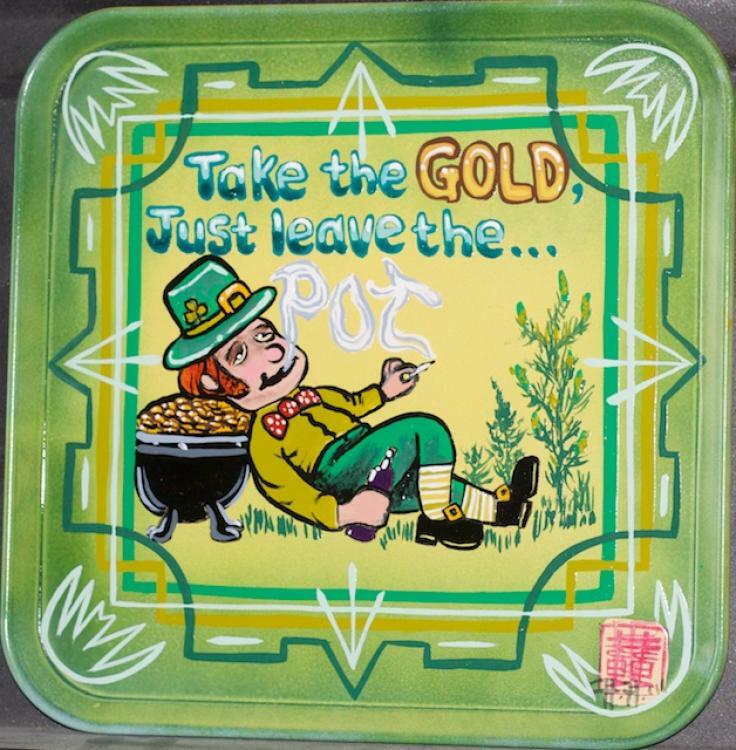 But, despite what the leftist leprechaun says, Hubba reminds us everything has its place and time: "I'd never smoke pot before going into the tattoo shop, because I take my job seriously. But I'm delighted I-502 passed... at the end of the day, it's going to be great before crawling into bed to watch old sci-fi movies." Hubba tattoos at Seattle Tattoo Emporium, where he has etched hide full time since 1990. When not tattooing, he paints at his International District warehouse, using 1-Shot sign painters enamel to create his weirdo art. Check out Hubba's current show 'Pulpmania' at Revolutions Cafe, Greenlake [7021 Woodlawn Ave., Seattle, WA 98115] through January 22, 2013. His work can be seen online at The Pinhead Lounge and his own website at www.enamelandink.com. A nifty 2013 calendar featuring 13 of the paintings from Pulpmania is available at his Etsy store.